Anger has been voiced after a controversial housing development in a Flintshire town has been granted permission on appeal. Four homes have already been built on the site of the former Royal British Legion in Gadlys Lane, Bagillt. However, Flintshire Council rejected proposals for six further properties after an impassioned plea from residents in March. Neighbours said the four homes already constructed had a negative impact on their privacy. Following the planning committee’s decision, an appeal was launched by the Chester Building Services Group. Inspectors appointed by the Welsh Government have now appoved the plans in a move which has been greeted with disapproval by the local community. Carl Renshaw, who sits on Bagillt Community Council, said: “I think the houses should be pulled down to be honest with you, they should never have been left to go ahead. “They’ve gone against planning permission and we feel that Flintshire County Council have let them do as they please. “They’re virtually looking into the houses behind and there’s no privacy for people. “Some have learnt to live with a bad situation, but most people are very unhappy. At March’s planning meeting, politicians expressed numerous concerns over the height of the houses. Cllr Kevin Hughes said the site visit had highlighted that the new houses were “unbelievably close”. Nearby resident Andy Davies previously stood in front of a digger as part of a one-man protest against the housing development. Despite the issues raised, planning inspector Iwan Lloyd said he felt the separation distances would be ‘acceptable’. In a decision notice published on Monday, he said: “The appeal proposal provides for similar separation distances as established by the previous permissions. “However, there are significant changes to the design to delete the rear roof space dormers/windows facing Beechcroft Close. 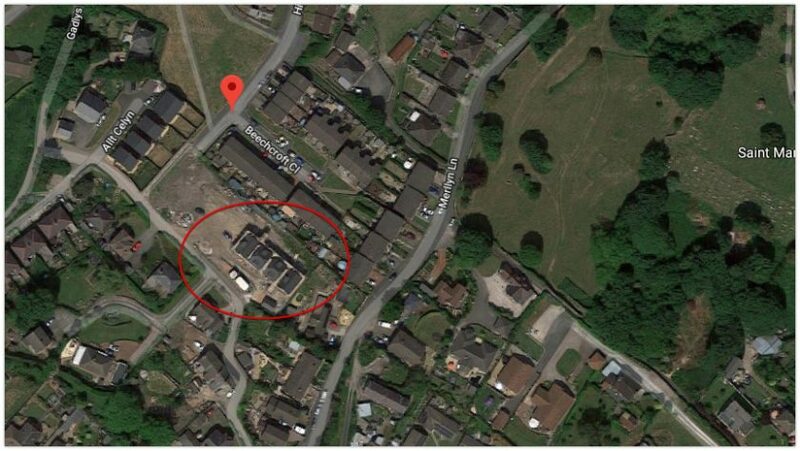 “Plots one to six would be positioned further from Beechcroft Close than the existing four dwellings already built. He said he noted concerns about the danger to children playing on the site, as well as issues over drainage and highway safety, but said he felt they had been sufficiently addressed. A planning obligation was submitted along with the appeal, setting out a payment of £1,100 per house to provide an on-site play area. Mr Lloyd said he did not feel it was necessary though.